"The boy stops, grips his knees, and totters, panting... After making sure the woman is no longer a threat, he lifts his face to scan the nearby buildings, searching for his savior. In doing so, he reveals an inflamed and swollen bite mark on his cheek, smeared with blood and drool. His roaming eyes find a tiny silhouette on the roof of the building across the street. His mouth spreads into a big, toothy grin. He raises his hand to wave hello. The top of his head explodes. On the roof of the building, a puff of smoke rises." 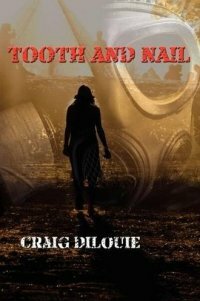 Such is the state of the world as portrayed Craig DiLouie's new novel, Tooth and Nail, where Mad Dogs, the infected, live only to spread their disease to anyone they can sink their teeth into. To describe the setting, take the outbreak stage of The Stand, but tweak the super flu to act more like the rage virus from 28 Days Later and extend the incubation period of the virus to a few hours. Then shrink the perspective down to a single company of US Army infantry, and place them in the center of New York City. That describes the situation the men of Charlie Company find themselves in after they're yanked out of Iraq, along with 250,000 other US military personnel around the world, and returned to the States to provide security in the face of increasing violence due to the raging Hong Kong Lyssa pandemic. They're ordered to protect a clinic in Manhattan, and told the situation is not yet serious. They quickly figure out that they were lied to. As the citizens of New York transform into ravaging hordes of infected all around them, they're ordered to do whatever it takes to get a trapped scientist out of the city; a scientist who has discovered what might lead to a cure for the disease. What follows makes for a very, very good book. As one character remarks early on, "Our situational awareness is extremely limited" and as readers, ours is too. We never know more than what the characters know; we are in the dark the same way they are. They wonder what's happening in their hometowns, with their families, and debate whether or not to try to reach them. We don't see the broader collapse of society across the country, but what's happening in New York is more than enough to keep us occupied. If you're current or former military, you'll feel right at home with the boys of Second Platoon. Told from a military perspective, the story is full of Army jargon and situations. But even if you don't know what an RTO or SAW or SINCGAR is, don't worry; DiLouie keeps the Army feel, but explains everything enough that no one will have trouble understanding it all. The characters, dialog, and situations are all entirely believable; I never found myself questioning if that's how events would really play out. And with several companies of US Army Infantry running through a city of millions of people, with rules of engagement that say kill anything that moves, you can imagine the level of action you get. I fully enjoyed almost everything about this book, with two minor quibbles. One, it's a bit short, only 250 pages or so (though I guess you can only have so many running street battles). Two, there's a formatting thing where at each scene break, there's a header with a sentence from the upcoming section. I found that distracting, since it breaks the flow of what you're reading. But other than that, this book is great; definitely the kind you can pick up and read again. There are a million stories that could be told in the universe that DiLouie has created, so if we're lucky, he'll come back to it with a sequel some day. If you're a fan of zombies, military fiction, or just fast paced action stories in general, I don't think you'll be disappointed with Tooth and Nail. ps By the way, other than the title, this book has nothing to do with the movie Tooth and Nail, though I think it would make a great movie of it's own. I juat started reading this book about a hour ago and now took my first break. Thanks for putting me onto this book. Would of never known about it if not for QE. Permuted press where I order all my Zombie books had nothing about this author or book.